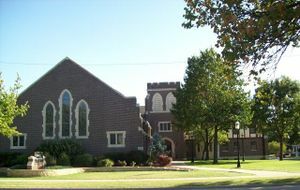 First Mennonite Church (Mennonite Church USA), Newton, Kansas, had its beginnings in 1877, when a few Mennonite families immigrating from South Russia settled east of Newton. Among them were Herman Sudermann, Senior, Herman Sudermann, Junior, and William Quiring. In 1878 with the coming of Peter Claassen, a minister from Prussia, the church secured its charter and joined the Western District Conference of the General Conference Mennonite Church. Services were held in a rented Baptist church until their new building was dedicated in 1881 on East First Street. In 1897 and 1902 the church was enlarged, and in 1932 replaced by a new brick church seating 700. Its first Sunday school was organized in 1881, its first choir in 1888 or 1889, Christian Endeavor in 1898, Junior Endeavor in 1920, Mission Sewing Society in 1887, and Mission Study Circle in 1933. By 1956, from this church had come thirteen ministers, eighteen missionaries, and five deaconesses. Ministers who had served the congregation to 1955 included Peter Claassen, Bernhard Regier, Senior, Abr. Suderman, Jacob Toews, J. R. Toews, B. Regier, J. E. Entz, Abram Warkentin, and D. J. Unruh (August 1944-early 1955). In 1956, First Mennonite's membership was 811, it was served by Arnold Epp as pastor. In 1955 a group withdrew to form the Newton Bible Church. Entz, J. E. "First Mennonite Church (Newton, Kansas, USA)." Global Anabaptist Mennonite Encyclopedia Online. 1957. Web. 21 Apr 2019. http://gameo.org/index.php?title=First_Mennonite_Church_(Newton,_Kansas,_USA)&oldid=103362. Entz, J. E. (1957). First Mennonite Church (Newton, Kansas, USA). Global Anabaptist Mennonite Encyclopedia Online. Retrieved 21 April 2019, from http://gameo.org/index.php?title=First_Mennonite_Church_(Newton,_Kansas,_USA)&oldid=103362. Adapted by permission of Herald Press, Harrisonburg, Virginia, from Mennonite Encyclopedia, Vol. 3, p. 868. All rights reserved. This page was last modified on 12 November 2013, at 18:30.